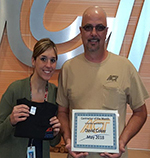 David Coker was selected for May Contractor of the month. His home is in Lebanon, MO and he has worked at ACT for 7 years. David loves the freedom and the travel that is like a paid vacation. His safety advice is to watch people around you and make sure you know what is going on at all times. Jessica Dye is David’s DSM.